Putting kids in jail is expensive. The annual cost of youth incarceration for a single individual is $112,555, according to the annual report of the Council of Economic Advisers. That's about 3.5 times the average tuition and fees at a four-year, non-profit private university ($32,405), and almost five times the average cost of tuition and fees at a four-year public university for an out-of-state student ($23,893), according to the report's data. The cost of incarceration is also more than 11.5 times the average for a year of Head Start ($9,770), and about nine times the cost of an average year of public school ($12,508). 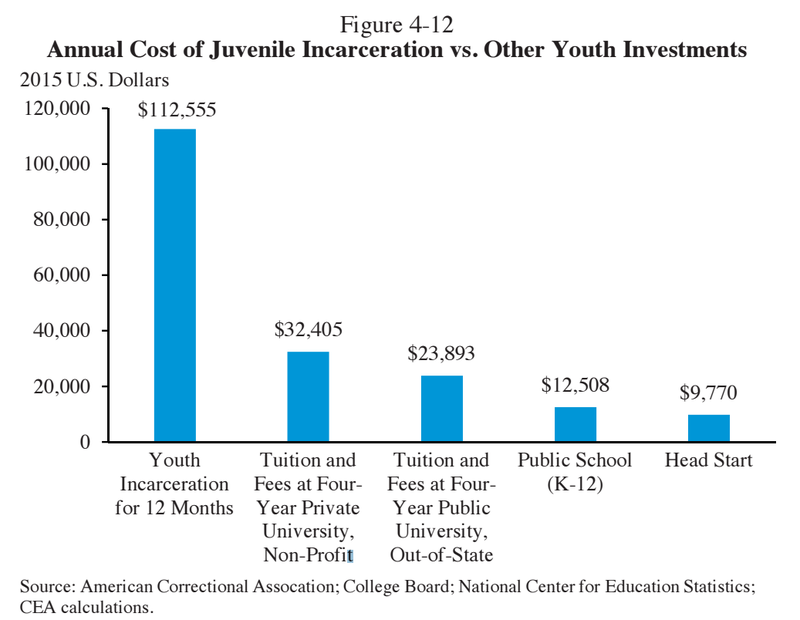 The huge expense of juvenile incarceration suggests that investment in early and upper level education is beneficial to society as a whole as well as to individual children. "Underinvestment in children's health and human capital in their earliest years can become more costly for society later in children's lives," the CEA's report notes. "Societal efforts that attempt to intervene later in life, for example through remedial education or the juvenile justice system, tend to be less cost-effective than interventions that help children get, and stay, on the right track in the first place," the authors continued. The CEA report goes on to note that there is evidence that suggests investments in early childhood education may reduce involvement with the criminal justice system and lower the social costs of crime and incarceration. These improvements in children's development could also reduce the need for special education placements and remedial education. Some of the early childhood investments like Head Start, which offer access to health services, have also helped improve the health of participants, according to the report. "Finally, public investments in young children, such as preschool, public health care, and income transfers, have been shown to improve children's long-term earnings potential .... When the children who receive these investments grow up, they pay more in taxes and are less likely to receive public assistance. As a result, making these early investments would actually increase revenue and reduce government expenditure over time." Check out the full report from the CEA here. Reality of incarceration in the U.S.